Kill Doctor Lucky has recently been re-released in a deluxe 19.5th Anniversary Edition. And another Cheapass classic, Before I Kill You, Mister Spy, is also coming back this year. To commemorate these two games, they've created a limited-edition expansion board, the Secret Lair of Doctor Lucky. 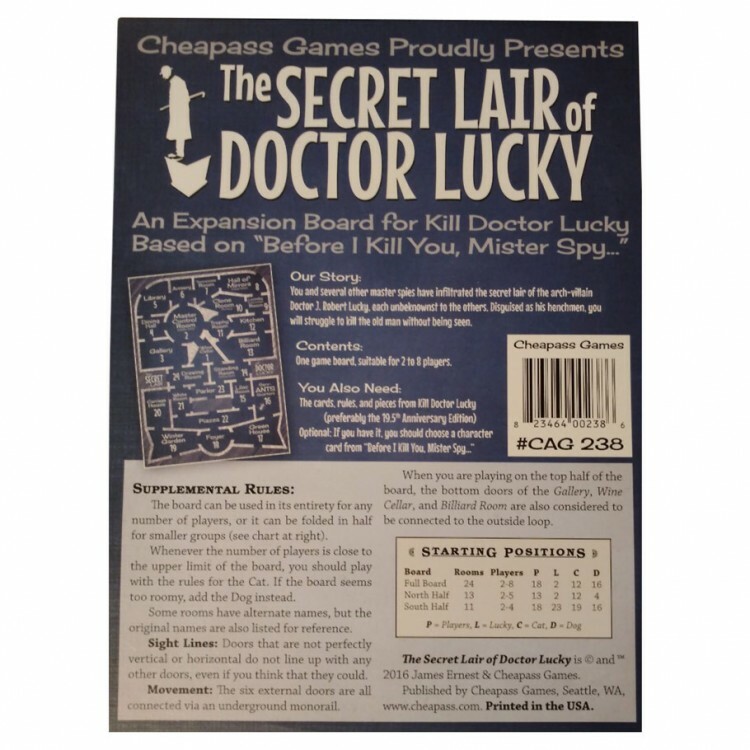 This board is compatible with all editions of Kill Doctor Lucky, but is specifically designed for use with the new 19.5th Edition rules. This tongue-in-cheek blueprint-style board has such notable rooms as the Hall of Mirrors, Master Control Room, Standing Room, and ServANTS Quarters (complete with ant). It's the perfect secret lair for the evil Doctor Lucky. This is an expansion board that requires the pawns, cards, and rules from Kill Doctor Lucky.